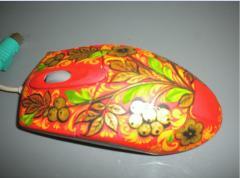 Mouse computer, drawn paints under the order. The list manually with acrylic paints is applied on surfaces of a computer mouse. The product is varnished. Drawing at the request of the customer is possible. List of a computer mouse under the order. List of a computer mouse under the order, unique drawings, the bright image. Unbelievable price on Business souvenirs in Chernigov (Ukraine) company Fabrika Hudozhestvennye promysly, OOO. Wide choice of quality products at affordable prices.